How can I make my corals more colourful? 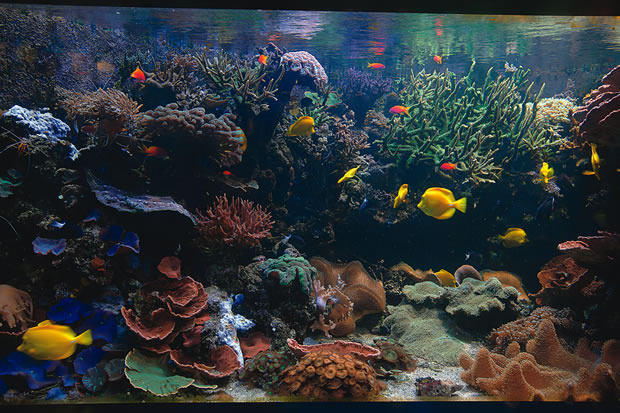 Corals in a reef aquarium often look quite dull, but it is possible to heighten their colours to remarkable levels. Jake Adams reveals how it\'s done. One person might be looking for more artificial, fluorescent colours from their corals, which are more prevalent in the higher Kelvin/bluer bulb reef hobby these days — another may be looking to get more natural, balanced coloured corals. When trying to distil the essence of what makes corals more colourful, the obvious answer is to try to get your corals as healthy as possible by optimising the conditions of your tank for the types you keep. High energy corals such as Acropora, Pocillopora and Seriatopora will most often look their most colourful when blasted with a maximum of light, with an equivalent amount of fast water flow and housed in aquaria with tightly-cycled nutrient levels in the water. Many Euphyllia, brain corals, soft corals and mushroom anemones often look their best and most colourful under slightly reduced light intensities and moderate flow speeds. Two factors holding true for developing and displaying more colours in corals are the use of lights with a range of colours and a small amount of activated carbon to remove organics from the water. Using lights with peaks in the red, blue, pink and yellow spectrums will ensure many different colours are displayed, if already present in your corals. Using a little activated carbon regularly in a reef aquarium will remove any discoloration to the water, which would prevent the colours of your corals showing true.